Paris ISD has implemented the free suite of web-based applications, Google Apps for Education, for our students, teachers, and staff. We are excited to offer Google Apps for Education as it represents an important step towards developing a 21st century approach to curriculum and learning. These tools will support the high levels of collaboration that are required in today’s classroom to prepare students with the communication and collaboration skills they need to be successful in educational settings and the work force. We are joining over 10 million other students and teachers that are already using Google Apps at schools around the world. This new system, powered by Google, provides Gmail to our school, as well as a suite of other Google products such as Google Drive, Google Docs, and Google Classroom that enable us to better communicate, share, and collaborate. 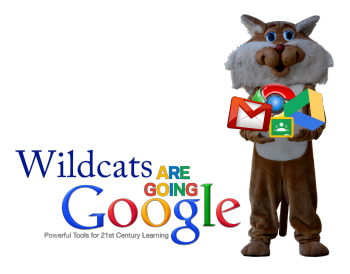 Google Apps for Education is available to PISD students, teachers, and staff via any internet-connected computer or mobile device from any location with internet access. The Paris ISD Google Apps for Education Policy provides more detailed information about our implementation of Google Apps for Education and how it will affect our students. Please click on the link below to access the policy. If you have any questions or concerns regarding GAFE, please contact Instructional Technology Specialist Missi Downs at missi.downs@parisisd.net.